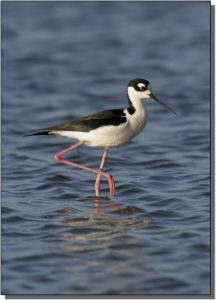 Description: A graceful, pigeon-sized shorebird, the Black-necked Stilt has a long neck, legs and wings. The basic black and white body contrasts with pink legs. Juveniles and nonbreeding adults are duller by comparison but still distinctive. Similar Species: Within the Great Plains, this species shouldn’t be confused with other shorebirds. Comments: Black-necked Stilts are found throughout wetlands within the southern Great Plains during the breeding season and during migration. They are extremely protective of their young and readily mob intruders. Their insistent, high-pitched, continuous calls can be quite distracting. Different races of this species are found throughout temperate and tropical zones around the globe.